Egypt told Hamas this week it needs to stop prevaricating over its commitment to the frail truce Cairo has managed to secure between it and Israel, according to an informed Egyptian official. Egypt had already managed to secure Israeli consent for “some” food and medicine to enter Gaza late on Tuesday after Israel blocked the transport of goods in retaliation for what it said was Hamas’ failure to stick to the terms of the truce mediated by Egypt earlier this month. While Hamas has been responsive, said the official, it needs to carry on being so if Cairo is to continue to try and secure a sustainable truce with Israel and encourage the US to go ahead with a reconstruction plan for the densely populated and impoverished Strip. Neither the Egyptian official nor the Hamas figure would confirm that a meeting between a Hamas delegation and Egyptian security and intelligence officials had been delayed as part Cairo’s attempts to pressure Hamas. Instead, they both said channels of communication are open and meetings are only a part of the ongoing consultations. European and Western diplomats in Cairo worry the situation on the borders between Gaza and Israel could explode accidentally. “I don’t think Hamas wants a war with Israel and I don’t think that Israel wants a war with Hamas, not a full-fledged conflict that would leave hundreds dead as it did in 2014. 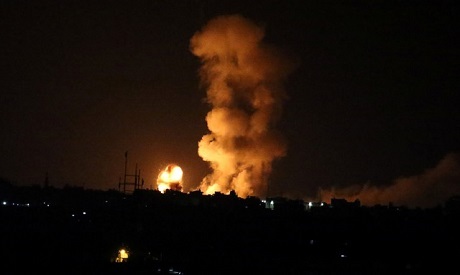 But given the frail situation there is no guarantee things do not get out of hand suddenly, and maybe even irreversibly,” said one European diplomat speaking earlier this week, after Israel conducted a new round of attacks against what it said were “Hamas militant targets”. A recent report by the International Crisis Group (ICG) warned that an escalation similar to Israel’s aggression against Gaza in 2014 which left 2,000 Palestinians and 70 Israelis dead and caused huge damage to the Strip could not be ruled out. Concerned diplomats say there is an increased international awareness that the harsh economic situation in Gaza is undermining stability. On Monday the UN’s humanitarian chief Zeid Raad Al-Husseini warned Israel that its “shocking” policies against Gaza had “the potential to generate threats to peace across a far broader region”. Earlier in the week, UN Chief Antonio Guterres said he was “gravely concerned over the escalation of violence in Gaza and southern Israel” and said that it is the responsibility of both sides to “urgently step back from the brink of another devastating conflict”. Hamas would expect Israel to commit to keeping a steady flow of food and medicine into Gaza and a prisoner exchange deal. The latter, says ICG, is likely to prove tricky, and there are no clear signs it is something to which the Israeli government could agree. Hamas also wants guarantees it will not be excluded from the political management of Gaza in favour of the Palestinian Authority (PA). Cairo, says the Gaza-based source, might be accommodating of Hamas concerns on this front given “tensions between Egypt and the PA over the so-called deal of the century”, but the US and the EU remain unsympathetic to Hamas demands for a limited PA role in Gaza under any Palestinian reconciliation deal that allows for a Gaza reconstruction plan. That reconstruction is supposed to be part of the mega political deal the administration of US President Donald Trump had promised to offer this summer. “It is unlikely now any deal will be ready by summer. In fact, there are doubts it will come this year at all,” says an informed regional diplomat. The delay in rolling out any deal is a result of Washington’s failure to secure either Palestinian or Israeli consent for its principles. There is also an acute lack of international support for the deal. Some European capitals have all but rejected it out of hand for failing to address the long-standing Palestinian right to statehood and Palestinian concerns over Muslim and Christian religious sites in Jerusalem. If the deal does not appear before the end of summer then the timetabling becomes ever more complex. There are UN General Assembly meetings late in September “and then we are practically on the eve of mid-term Congressional elections in the US”. But once Trump is done with mid-term elections it will be close to the Christmas holidays. And while diplomacy generally picks up by mid-January elections in Israel are scheduled early in March “and it is highly unlikely that Netanyahu would want to even discuss a deal that talks about Jerusalem and Palestinian refugees on the eve of elections”. According to Cairo-based European diplomats, it is more likely that the US might agree to an Egyptian proposal, supported by the UAE, to begin with the reconstruction of Gaza which could defuse a possible war neither Egypt nor Israel wants to see happen. The same diplomats say the US is not as opposed to the “Gaza first” idea as it was just a few months ago though Washington would press for security arrangements between Gaza and Israel. Informed Egyptian sources say Cairo is “hard at work” paving the way for a reconstruction plan and is willing to leave the mega political deal between Palestinians and Israelis for later. In this respect Egyptian efforts to de-escalate the situation along the Gaza- Israel border, and ensure Hamas does not unintentionally provoke Israel into any strikes, remain essential. Meanwhile, concerns about developments on the Syrian Israeli front were compounded when Israel shot down a Syrian fighter jet over the Golan on Tuesday. The UN’s Middle East envoy Nickolay Mladenov warned that there has been “a disturbing trajectory of increasingly frequent and dangerous confrontations” between Israel and Syria.